21/2/13 - Internet - More and more English and American art historians (as well as some enlightened art enthusiasts) are opening fascinating blogs. These either point out specific news, often on a precise point, or else present previously unpublished art history studies, at times focusing on very specialized subjects. Among these blogs, we had already pointed out the excellent one by Bendor Grosvenor, Art History News. His latest posting points out the existence of another blog, highlighting the history of painting in Florence by the art historian David Packwood. 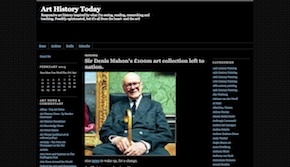 The latter is also the author of another, more general, site, Art History Today which we included in our links page but which we said in 2008 had disappeared. However, the old version is available here (but strangely without images) and in fact, returned in 2009 in a different form, at this site ! Another equally fascinating blog goes by the humorous title of Grumpy Art Historian. The author told us he was only an "amateur" but a knowledgeable, well informed one whose opinions are particularly pertinent. We recommend it to our readers. To our knowledge, there are no such blogs of this type in France (we would be happy to be proven wrong). We would, though, like to mention the one by Jérôme Delaplanche, often very interesting but not updated regularly enough to our taste, as well as that of Stéphane Guégan devoted to exhibitions and book reviews (we had already mentioned it), not only art history. 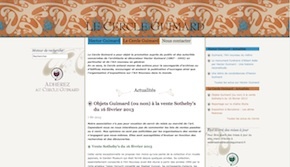 For lovers of the French 17th century, we should recall Sylvain Kerspern’s site. Other sites highlight a single artist or movement. For the 18th century, readers should consult Martin Eidelberg’s on Watteau and his circle. They will find essays on Watteau, Nicolas Vleughel’s and Bonaventure de Bar, available online since 2011. Skipping forward in time, we arrive at Art Nouveau and Hector Guimard with Le Cercle Guimard, a very rich site which also presents current news, with the "purpose of promoting, among the public and the concerned authorities, the architect and decorator Hector Guimard (1867-1942) in particular and Art Nouveau in general.". We should point out here that the artist has now entered the public domain and that images of his work may be freely reproduced. Still in Art Nouveau, we would also refer our readers to the site of the Art Nouveau network (Réseau Art Nouveau Network), which is Belgian but groups many institutions interested in Art Nouveau. It was on this site that we discovered in writing this article, the blog of the Musée de l’Ecole de Nancy, often updated, and which we also recommend . Although not devoted to an artist, we would nevertheless like to mention the scholarly edition, on internet, of the correspondence between Juliette Drouais and Victor Hugo, of valuable use to art historians. The letters are posted online progressively. We conclude this eclectic news item with the Technical Bulletin of the National Gallery of London, now available online at this address and with a link pointed out by Nicole Tamburini in one of our commentary pages , to the Cornucopia site, specialized in the study of the 16th century (not only art, but also literature, history, music...). However, it is not very user friendly and still a bit confusing. Again on Art Nouveau, we should recall the blog Paris 1900, unfortunately not updated very often but extremely rich and presenting many little-known buildings. Next article in News Items : Watteau or not Watteau ?